Falls through fragile roof surfaces are one of biggest causes of serious injuries. Effective precautions must be taken for all work on or near fragile surfaces, no matter how short the duration. Accidents can be avoided as long as suitable equipment is used and those carrying out the work are provided with adequate information, training and supervision. The principles of working on fragile surfaces are exactly the same as any other form of work at height, you need to apply the hierarchy of control to ensure that the work can be carried out safely. 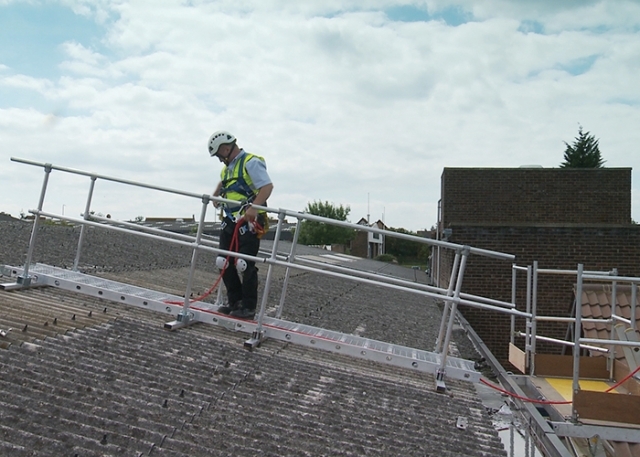 The preferred option is to avoid working at height, but this isn’t always possible, so the next consideration should be to look at methods which could allow work to be carried out without actually stepping onto the fragile roof itself, such as Mobile Elevating Work Platforms (MEWPs). If access onto the fragile roof cannot be avoided, you need to conduct a thorough Risk Assessment and look at how the area can be accessed safely, and then put into place measures that can alleviate the distance and consequences of a potential fall. When access is needed from the eaves to the ridge, mesh walkways spread the load across the support battens, giving workers a safer working position. 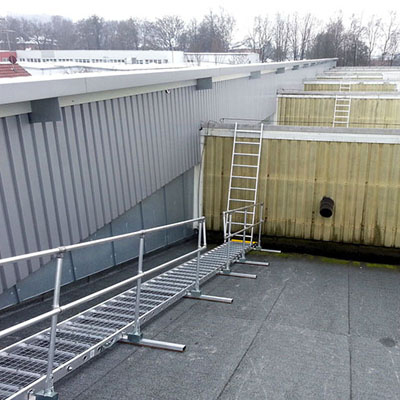 Board-Walk, our open mesh walkway system, has been designed specifically to allow work to be carried out safely on fragile and industrial roofs. The system allows access from the eaves to ridge, whilst spreading the load on support battens to provide the user with a safer working position. The system is lightweight and easily portable, making it ideal for use on fragile roofs. The Board-Walk system is compliant with EN12811-1. Board-Walk is modular and features 1m, 2m, 3m & 4m sections which are quickly and easily linked together and an integral full length work positioning line. Single or double sided handrails, a roof hook and a valley stop end are all available as extras. To learn more about the Board-Walk walkway you can download our Fragile Roof Access brochure and watch the Board-Walk video.